P-3814 AN EXCEPTIONAL COLIMA HUNCHBACK FIGURE, PROTOCLASSIC, CA 100 B.C. - A.D. 250. Ceramic with red to reddish-brown slip. Provenance: 1) Private Collection, Houston, Texas, acquired in the 1960s. 2) The Anthropos Gallery, acquired in 2006. 3) California Private Collection. Cf. Townsend, Richard, Ancient West Mexico: Art & Archaeology of the Unknown Past, Art Institute of Chicago, Cat. 27, Chicago, 1998 for a similar example. According to Townsend, (p.24), the double-pendants on the necklace are emblems of high rank and status found throughout Mesoamerica. 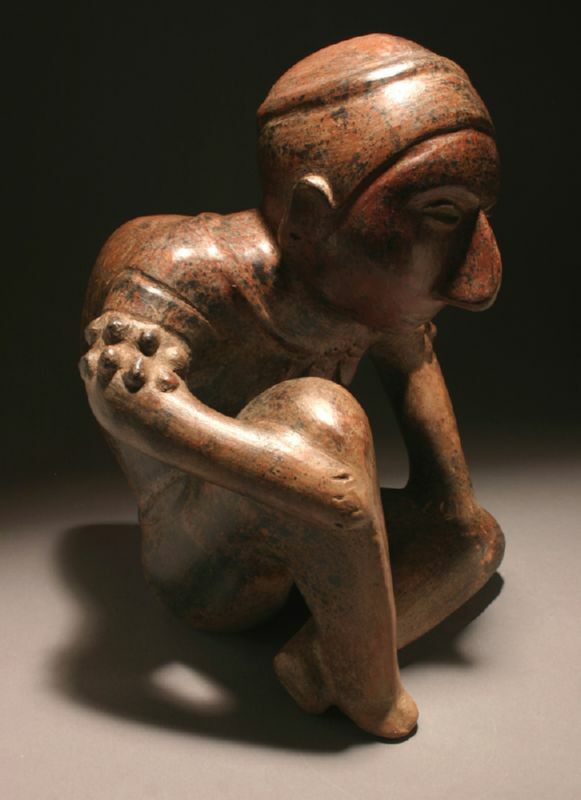 The figure sits hunched over accentuating his double-lobed deformity, with his right hand holding his raised knee, his left resting upon his left knee, both knees deformed with pointed saber shins,wearing a double-pendant necklace, cicatrice scarification upon the upper arms and the fitted cap of a shaman; painted overall in reddish brown, burnished, with manganese oxide deposits throughout and within the surface. Colima ceramics are distinguished by the wide variety of subjects represented, and most notably by the naturalism with which they are portrayed, and he heavy reliance on modeling for detail. The present work, although somewhat small in size, is a monumental achievement by the artist who captured the naturalistic accuracy of the figure, together with the juxtaposition of shapes, angles, and lines caused by the deformities.